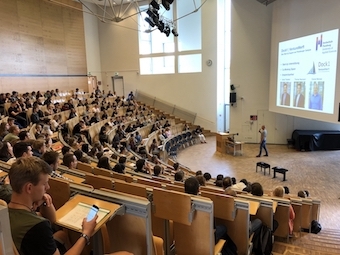 About 1.831 new students from Europa Universität Flensburg and around 1.000 students of Hochschule Flensburg are beginning their studies this winter term. The Dock1 was part of the exciting welcome events and welcomed the new potential entrepreneurs in the Flens Arena and at an exhibition stand on the “Markt der Möglichkeiten”. This was our "Stapellauf" 2018! This year for the first time, the Dock1 ended the semester in a relaxed atmosphere and together with all friends! We had a nice Barbecue and great opportunities for networking: the summer party brought together start-ups, students, university members and those interested in founding. This year, the 5thInternational Green Entrepreneurship Forum (IGEF) took place at the two-day Waterkant #StartupSH Festival in Kiel (14. and 15. June 2018). In more than 15 sessions and workshops local and international speakers connected entrepreneurship with topics like GreenTech, Renewable Energies, Mobility, CleanTech, FinTech and Sustainability. In total, more than 1.000 representatives from politics, science and economic sectors joined the start-up festival and the green entrepreneurship sessions of the IGEF. In the fourth edition of the pro-workshop series by Dock1, we wanted to address the important and yet often so complex topic of choosing the legal form and dealing with tax obligations for start-ups.